If I were selling my car in Perth, the last thing I would squeeze in beforehand is a weekend drive to the illustrious Margaret River. It’s only three hours south from the city and could almost be made into a one-day tour, but even a weekend is hardly enough to enjoy all of the wonders on offer in this beautiful south-western town. Either way, it’s recommended to start the trip relatively early in the morning, and make sure you arrive with an empty enough belly so you can take part in the renowned local cuisine. Leaving from the CBD, you have the option to drive the whole way on State Route 2, or you can veer off onto the South Western Highway/State Route 20 near Pinjarra and take the slightly more scenic route, which adds only an extra ten kilometres. There are many possible stops along the way, but there’s so much to do at the final destination that it is wise to get at least an hour in on your first leg. After roughly 70 kilometres on the highway you will find yourself at the Manjoogoordap exit, which takes you about ten minutes off the main road to the town of Mandurah. You can make this a quick stop to stretch your legs, or you can spend a little time enjoying this lesser-known yet charming town. Happy dolphin viewing at Dolphin Quay and Mandurah, WA. If you have kids in the car you might want to wander down to Dolphin Quay. This is a great place to have a small bite to eat and yes, to see dolphins. If you fancy a quick swim and a stroll then head to either Silver Sands or Halls Head Beaches. There’s nothing so wrong about some wide sand and crystal waters, even on a pit stop. 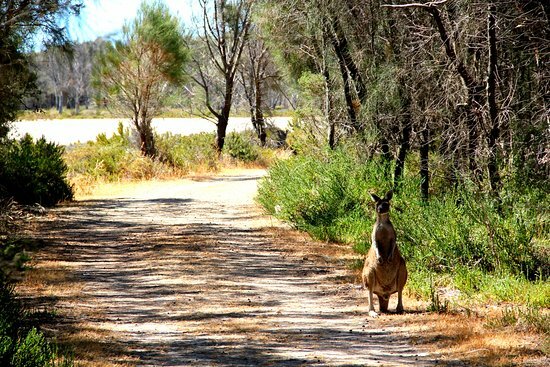 Another option is to head into the Creery Wetlands Nature Reserve with a take-away coffee to listen to the birdlife and watch the kangaroos lounging about. A friendly resident of the Creery Wetlands Reserve in Mandurah, WA. Drive out on Pinjarra Road to the South Western Highway and head south for a little over an hour until you see Waterloo Road into the Ferguson Valley. This area is so lush with food and wineries and natural scenery that you could spend quite a bit of time here if you choose. 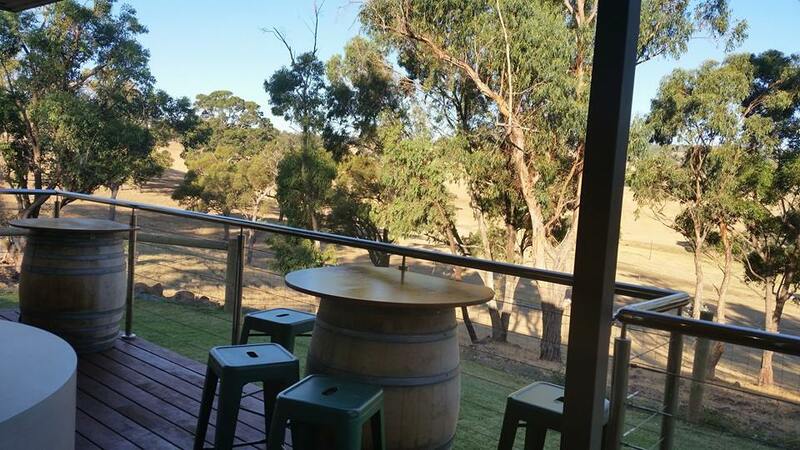 If you’re into the wine then you might try Ferguson Falls Farm Winery which also has a lovely cafe, or head to Angelicus for views of Bunbury and the coastline. If you’re more of a beer goer then definitely do some tastings at the Moody Cow Brewery. The view over the Ferguson Valley from the Ferguson Falls Winery Cafe, WA. After you’ve fed and drunk to your fill you may fancy a stroll into the magical Crooked Brook Forest or perhaps a swim in the Honeymoon Pool in Wellington National Park. The wonderful thing about this area is that the locals are very friendly and usually very pleased to recommend places to swim or eat or relax. Again, if you’ve got kiddies in the car then another detour you may consider is a very peculiar and fascinating place called Gnomesville. It is only about a ten minute drive from the Ferguson Falls Winery onto Wellington Mill Rd and just east of the Crooked Brook walking trails you may have explored. Gnomesville gets its name quite literally from the over three thousand gnomes that are hiding behind every bush and within every garden. You can check the official website to see a listing of nearly every gnome. 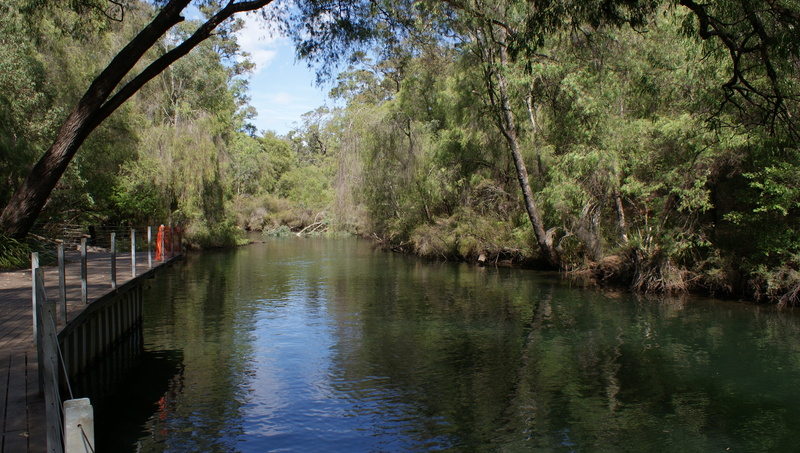 The Honeymoon Pool swim spot deep within the Wellington Forest National Park, WA. From Gnomesville there is one more stop before the end. Wind your way from Ferguson Road through Dardanup onto State Highway 10 and all the way to the end of Bunker Bay Road. This is just under an hour and a half drive and you’ll find yourself at the tip of a small peninsula at the Pullman Bunker Bay Resort. You’re so close to Margaret River at this point that you might be itching to get on your way, but it’s a stop not to be missed. The Bay itself is a few kilometres of luscious white sand and turquoise water that you can see straight through to the sandy ocean floor. You don’t have to stay at the resort to enjoy to delightful local cuisine they serve overlooking the bush and the horizon over the sea. After lunch you can wander to the Cape Naturaliste Lighthouse and follow along on the Cape to Cape Walk. If you’re still looking for a little taste of the local ferments then it’s only a couple of minutes to the Wise’s Winery and the Eagle Bay Brewing Company. This area is an absolute luxury for all of your sensations. 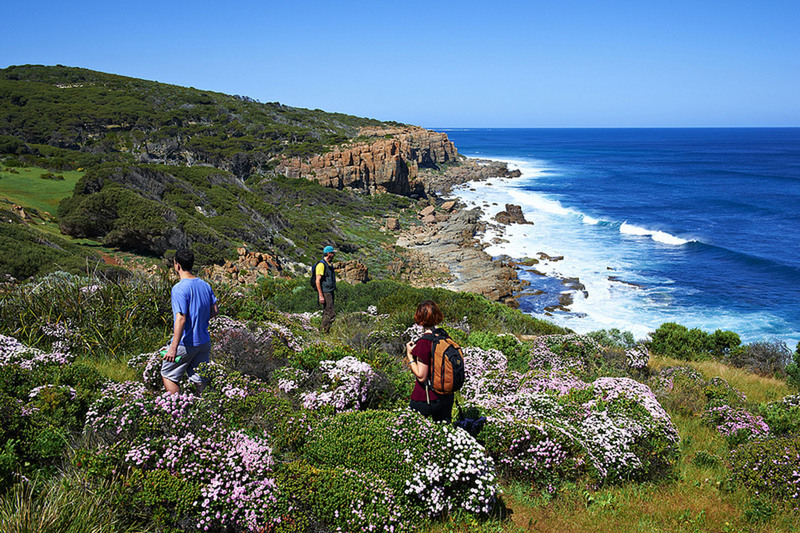 Meandering through wildflowers along the Cape to Cape walk in Bunker Bay, WA. Home stretch! You can easily drive back to the highway to finish the trip but a more scenic option is to take Bunker Bay Rd to Cape Naturaliste Rd then hop on Caves road which will take you the remaining sixty or so kilometres. Another benefit of this route is that it passes through Yallingup. You might want to take a peek at Indijinup or Smith’s Beach and revel at the dramatic rugged coastline and excellent surf. Half an hour after that and you should reach Margaret River. As you approach the town along Caves Road you will notice numerous signs for wineries, and it is definitely advisable to drive in for a taste. Some of the favourites in the area are Leeuwin Estate, Vasse Felix, and Cullen’s Vineyard. They range from upscale to casual and many serve fantastic food to pair with the wine. If you’ve got a surfer in the car then you must drive out to the famous surf breaks of Fraggle Rock, Mainbreak, Bombie, and even the mouth of Margaret River. Redgate Beach and Hamelin Bay are good spots if you just enjoy to swim and sunbathe. 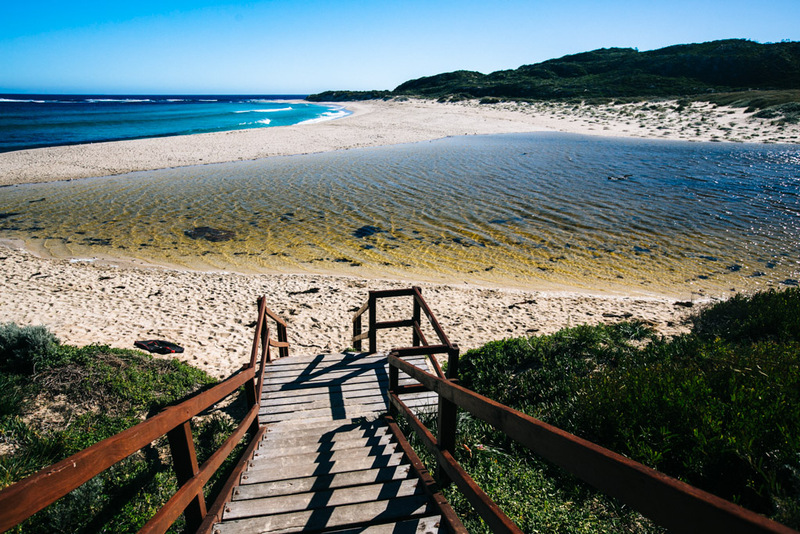 The entrance to the mouth of the Margaret River, a popular spot for swimming and sunbathing. There are so many things to do and eat and drink that it really is deserving of at least one night in the area. If you started the journey on a Friday then the best way you can start your journey home is to go early to the Saturday Markets. Then at least you can stock up on all the local bread and cheese before heading back home. Take the longer route to enjoy a drive through the tall Karri Trees of the Boronup Forest. The speckled light filtering through the forest makes for a mesmerising journey, you’ll be in a trance for the three hour drive back. If you’re still living in Perth after you sell your car, and you’ve got a chance to take a roadtrip with friends, make sure you bookmark this page so you can take them on this magical tour and relive it again yourself!